Philadelphia, PA: Ethan Hermann and Evan Skalski braved heavy rain early Saturday morning at the Run for Clean Air. The pair was rewarded for their toughness as each recorded strong performances. Ethan ran the 5k and crossed the finish line solidly under 16 minutes. His 15:49 was good for first overall. He also scored an interview on 6 ABC! Meanwhile, Evan selected the 10k race in preparation for Broad Street (two weeks away!). His 39:31 placed him at 10th overall and 2nd in his age group. Nice job guys! Chester, PA: Sam Roecker represented PRTC in the 10k at the Widener Invitational. Originally slated for Friday evening, this race was pushed to Saturday for fear of thunderstorms (as was the 5k). Sam adapted well to the late change by winning the women's race by more than two minutes! Her 35:34 was very close to her all-time best in the distance (35:21). We'll see her again at Broad Street! As evening fell, morning rain gave way to seasonably warm April temperatures. Wind was non-existent and the Widener track was fast. Perfect timing for the men's team to compete in the 5k. Chris Mateer led the charge with an excellent 15:01. This was a 6 second PR breaking his previous best which was set when he was a Geneseo athlete! Simon Vorhees was fast on Chris' heels. His 15:05 became his 2nd fastest lifetime 5k. Kevin Brandon held his own in the fast heat by pacing himself to a 15:19. Alexis Geslin followed in heat two with a major breakthrough. He took 40 seconds off of his previous best 5k and ran 15:41. Similarly, Max Krall laid claim to his first sub 17 minute 5k by a remarkable 16 seconds. Great work! 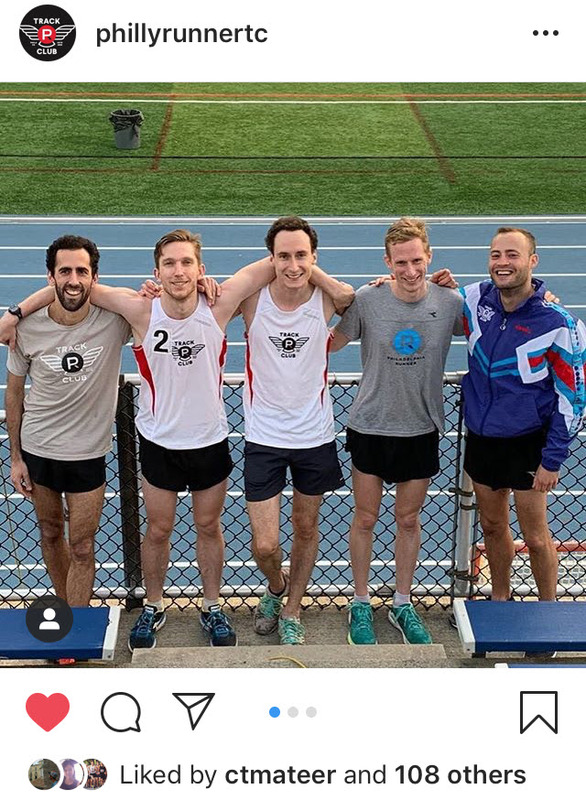 Princeton, NJ: Chris Hatler joined the fun on the track on Saturday by notching his 2nd PRTC club record in the "outdoor track" category at the Larry Ellis Invitational. His 1:52.59 800 meter run replaces Marc Cianfrani's 1:53.66. Marc set this time in 2005 at the Widener Invitational. Congrats Chris! Looking forward to the mile at Penn Relays this weekend!